Single seater : model SEAYAK from Prijon in polythene. "The name SEAYAK has been synonym for fast, attractive kayaks with safe and manageable riding qualities for many years. Three different shapes are on offer to provide every paddler with the ideal boat for larger rivers, lakes or along the coast. Double seater : model POSEIDON from Prijon in polythene. "The bow and stern of the POSEIDON possess pronounced keel lines, which ensure better tracking and a pleasant travelling speed. Thanks to the pronounced keels and its width of 68cm the POSEIDON is one of our most stable kayaks. Of course the POSEIDON comes with a comfortable seat-system, suitable for longer distances and is equipped with our new 3D-thigh braces. That means lower weight and increased comfort! All our kayaks are equipped with 2 waterproof chambers and safety line. Paddles, kayak skirt (Prijon) and life jacket are provided. 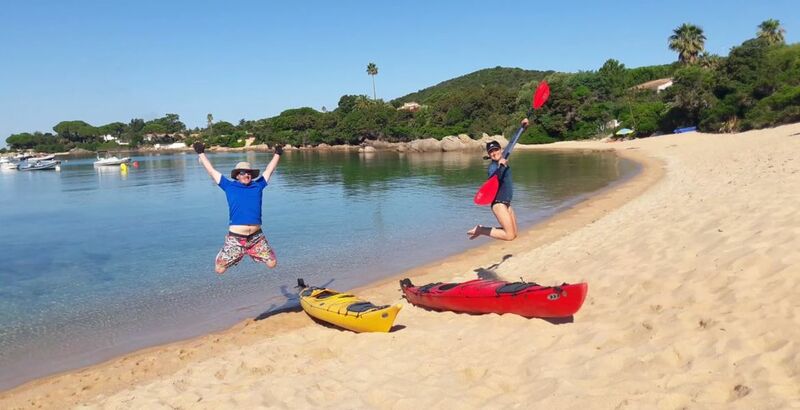 The collect of your kayaks can be done directly at our Cors'Aventure base in Eccica-Suarella. However, you can also leave your car at our base, prepare your equipment and your kayak and we can drop you and do the launch at our base in Porticcio. The collect will be done the same way. Kayak, paddle, skirt (Prijon) and life jacket. On request and with a additional transport fee, drop-off and collect can be done at other places than our base in Porticcio.